Looking for a brain boost? Stop reaching for those sugar filled cans telling you they'll help you "fly" and crack open a tub of AMINO-IQ. Designed to kick your brain into another gear AMINO-IQ has the added advantage of properly dosed nootropics, essential amino acids, natural sweeteners and all natural colours. If all that wasn't reason enough to love this very unique product, AMINO-IQ is part of our "CANDY SHOPPE SERIES" offering you mouth watering flavours like Red, White & Boom (Rocket Pop), Watermelon Candy, Tangerine Jelly Bean and Banana Ice Pop. AMINO-IQ's versatility makes it the perfect choice for both mental and physical performance. Whether its to study, work, train or gain, it's time to go Beyond Yourself with AMINO-IQ. • Promotes alertness, wakefulness and enhances cognitive performance. • Supports cognitive health and brain function. • Relieves fatigue, promotes endurance and enhances motor performance. • Source of essential amino acids to increase muscular protein synthesis. • Assists in the building of lean muscle mass. • Natural sweetner (Stevia) and natural colours (all naturally occurring). • The only nootropic BCAA in the Canadian market. • Can be taken for both mental and physical performance. 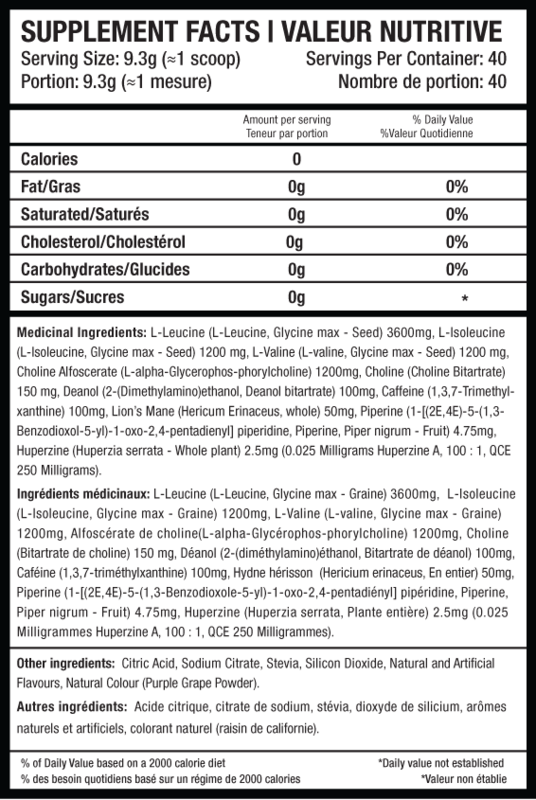 • 3:1:1 vegan BCAA (3600mg Leucine) + proven nootropic ingredients. • Full recommended dose of ALPHA GPC (1200mg) for cognitive enhancement.